Should Pelosi be allowed to push health care through House without a vote? House Speaker Nancy Pelosi may call for a vote on a rule that would simply 'deem' the Senate health care bill passed. House Speaker Nancy Pelosi may try to pass the controversial health care reform bill without making members vote on it. Unbelievable. Pelosi says she might use a procedural tactic where the House will vote on the package of fixes to the Senate bill... and then that vote would signify that lawmakers "deem" the health care bill to be passed. Politically speaking, this is beyond sleazy. It's meant to protect Democrats - especially those up for re-election in November - from having to make a tough vote. Pelosi says of this process, "I like it... because people don't have to vote on the Senate bill." In Nancy Pelosi's world, accountability is a dirty word. The Senate bill, of course, contains many provisions that are unpopular among some House Democrats - including language on abortion funding and taxes on high-cost insurance plans. This tactic has been used in the past - but never for something as big and important as the nearly $900 billion health care reform bill. Republicans are jumping all over this - and rightfully so. They're painting it as a way for Democrats to avoid taking responsibility. Some even suggest it's unconstitutional. Meanwhile President Obama is campaigning relentlessly - calling on lawmakers to pass health care reform, "I want some courage. I want us to do the right thing." The irony here is if Nancy Pelosi gets her way, it won't take much courage at all on the part of our so-called representatives. Here’s my question to you: Should Nancy Pelosi be allowed to push health care reform through the House without a vote? This is what we've come to expect from Pelosi and her ilk. It explains the shocking January revolt in Mass. and hints at a possible Democratic slaughter in November 2010 if they use such a tactic. I suppose saying 'no' to such an unaffordable monstrosity doesn't qualify as being courageous in Obama's world. So typical. I voted for Reid and Obama, but I can tell you I was sadly mistaken. I was taken in like so many others, but I will reflect my anger in November and again in 2012 against Obama. People I talk to consider Pelosi to be an idiot. How she got there mystifies us. Our govt. is acting just as the communists do and they have forgotten they work for the American people. I'm not exactly a humongous fan of the bill and would rather see the Medicare buy-in. But, this is a standard procedure used extensively by both parties. Okay, what do we have representatives for? To vote in our interest? Speak the will and desires of the people?... If the health bill has so many issues, should not someone stand up and say: Hey, maybe we need to go back to the drawing board? Maybe we need solutions proposed not by lawyers but by educated, caring American physicians, administrators and people who actually work in the trenches of health care who know what the real problems are. At this point, anything that gets this thing passed is a good thing. This bill will save a lot of lives and a lot of money and the sooner we can get to doing those two things, the better. I can't agree with you more. The president says he wants an up-or-down vote on health care and for someone to show some courage. I guess the speaker didn't get the memo. To answer your question – In the best interest of the nation – whatever works should be done. If 100 people are making mistake on the same question does not necessarily mean the question is wrong. I think it speaks a lot about the character and integrity of members of congress if they vote keeping an eye on their political future. As representatives of the people – the so called "average American", they should vote based on the best interests of the people they represent. If they need to find the courage to do the right thing, they shouldn't be sitting in the Capitol Hill in the first place. Why such a big huppla over Americans health care? We gave Iraq our house! Now lets give Americans no health care too? I've never seen government act this corruptly. If Pelosi can't even get the votes from her own party to pass the Senate bill when they are planning to reconciliation to make changes to it, not getting the votes can't be the answer. Americans should be outraged that the representatives they've elect aren't even treating their constituents with enough dignity of taking a vote before passing a piece of legislation this sweeping and expensive. They are supposed to representing US–if they aren't comfortable actually voting "yes", it's because they know that WE don't want it. No - if they've got the guts to do this knowing that the majority of the country is against it...then have the guts to stand up and openly cast your vote. By any means necessary. The House Repuglicans have made it widely known that they are against the bill through smears and a bevy of misinformation, so why should an equally unsavory tactic not be allowed if it will get the damn bill passed. I say kudos to the Speaker for being ruthless, something other Democrats should try. The simple answer is 'no' because good legislation should stand on its own for a vote. The complicated answer is 'yes' because if you are a democrat, then you NEED to pass some kind of bill by any means necessary–and not simply roll over. Remember, a year ago, the Dems were overwhelmingly elected to reform. The question then becomes, why does a mechanism like this even exist for passing bills if it is "sleazy"? I find it appalling that we are trying to pass legislation that can't stand on it's own legs. To me, is shows how poor the legislation is and it screams "just say no" and get it right! I can't believe the cloak and dagger approach being taken to spend 900 Billion tax dollars. dont put the blame on the democrats or pelosi. many of us dont like the bill or what it provides and costs, but the republican power of no has gone against any and all health care ideas with NO plan of their own or any intentions of trying to implement a plan of their own. they are just as guilty if this plan is approved! Pass it however you can. The lies being used and the fear being spread has to be countered and the only way to do it now is pass the bill and show what it really has to offer. Just when you think you've seen it all in Washington... along comes something like this:? Then you weren't paying attention: these self-executing rules have been used by both Democratic and Republican congressional majorities. Congress used it 36 times in 2005 and 2006, when the GOP was in charge. Doesn't make it "right" but certainly seems to be a bipartisan procedure. Our representatives lost their political courage a long time ago. This is just another example of doing what they want, and not listening to the american people. I rarely agree with you Jack but this time your dead on the mark. 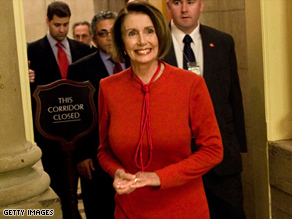 Nancy Pelosi.....a nightmare in a red dress! Absolutely. If that is what it takes to get it passed, absolutely. We can no longer depend on the Party of No for anything. GOP will not be winning in November. We will all see to that. They are absolutely worthless. And we will never forget how one lone Republican held up Unemployment Benefits for the Jobless. Absolutely not!!! This is the worst possible way to fundamentally change anything much less something so big and important as this. Hi Jack, our country is falling apart. The politicians have abused our legislative and executive branches of the government so bad that USA is looking more and more like a third world state. Unless Ms. Pelosi invented this "procedural tactic" (did she?) then it's been around for a while. And presumably used before, by whom and for what purpose I don't know. As a way to "move forward" this is hard to admire. On the other hand, the GOP seems to have as its sole mission negating and otherwise blocking every single Obama initiative. At present, there is little to admire on either side of the aisle. The Dems do indeed seem to be running for cover. But it was a Republican after all who called the President a liar during a live, nationally televised speech. It's hard to say what it will take to settle that score–even if Obama himself is satisfied that the matter is resolved. For the time being, it's hardball all around in Congress. The last one standing wins. No, Our nation started with a bill called the Declaration of Independence. Then our leaders then had to stand up (under the shadow of a noose) and sign their names. Today, our elected leaders should have the backbones to sign their names to this much needed health reform. This woman is evil. What one party does now the other party will do later? What will they be screaming then, how unfair it is? Wow, But I can say I'm not surprised. After seeing what the rightwingnuts have done to this country over the past 10 years, DO IT. The Republicans have used this in the past too. So what's the big deal? OK for one, OK for the other. Absolutely not! Does California support a recall mechanism? No. I do remeber the Republicans passing the Bush tax cuts both times, and even back then I would say no. I want our "Represenitives" to show they have a pair and vote. Its what I do. Jack, on-the-one-hand, if Nancy Pelosi gets her way it only says that they want her to do it and to take all the heat for it, if any. On- the-other-hand, once Americans like having health care reformed, they will all claim it is because they did not vote against it. Slick! This is a completely sleazy approach. If the bill can't pass on it's own merits (due to the representatives fear of coming home for the next election), then perhaps it's time to address the substance of the bill. No, it should not be allowed. Regardless of which side of the issue you are on, this IS NOT how legislation should be enacted in the United States. Pelosi is so blinded by her personal agenda that she has lost all sight of reality and perspective. Her objective is to pass something...anything...at any cost. Equally frustrating is the argument that, "the other party did this in the past, so it's ok for us to do it now". this has been applied to both the deem process as well as reconciliation. The fact is that these tactics are never right, regardless of who is in the majority. Of course they should be forced to vote on it! But this is the dysfunctional way our congressional "leaders" think. They don't want to vote on any one thing because that would concretely tie them to a particular stance on an issue. This is why they combine hundreds of unrelated items in every bill. It allows them to say "I didn't vote for X that was in the bill.....I was voting for Y that was in the bill...somebody else wanted X so I tossed it in to get their vote". Leave it to somebody with a completely screwed up moral compass like Pelosi to think this is a good idea! Let the American People Vote. We get to Vote for our President. We should be allowed to Vote for our Health Care. It is a Democratic Republic after all. I want my Vote Mr President. Are we able to impeach her and get her out of Congress!!!! of our lives? Absolutely Jack..The House & the Sanate have ALREADY passed bills. There is no reason not to pass the bill, have the congress make some fixes and get on with making America great again by giving access to Healthcare to everyone (Just like all the other major Industrial countries in the world). Healthcare for all is just as much of a right as a Public Education for all. If "deeming" it done is what it takes to get it done and defeat those idiiots in the PARTY of NO, then I say do it!! Should it be allowed? Well no, but since I'm neither an insurance company, banker or pharmacy company, I don't really expect the government to care what I think. They'll do their thing, and the players they care about will give them money to get TV time to be elected. They'll tell the illiterate forgetful electorate how to vote, and things will be things without regard to irrelevant concern for concepts like "right" and "wrong." People must understand that many in the house are against the senate bill b/c it's not progressive enough, others are scared of being voted out in their respective district. Though it doesn't matter, if you're in a red state chances are you're on your way out anyway. Lastly many members don't want to vote for this version of the senate bill, due to the Nebraska kick back and the hand out to the unions......However they can and will fix these deals w/ the reconciliation package. Vote!!!! They've come this far, why not vote? Republicans and Democrats need to be accountable for a vote. It does not matter if they are up for reelection or not. It sounds like the Democrats just want to JAM it down the throat of the the American people. Pelosi can take her idea and put it where the sun don't shine! If you can save having to pass the lousy Senate bill and then change it immediately, why not. I wish one of the changes required physicians and hospitals to charge individuals the same rates as they do health insurance companies. That sure wouldn't cost much and would really help when you insurance denied a claim.. Absolutely not! What should be pushed out with a vote from the American people are the senators and representatives who are trying to push this through even though public opinion is uprising against it. We need health reform but not this one or this way. And since when did student loans have anything to do with health reform. Wake up Washington...including our President and all members of Congress!!! At this point anything that gets this thing passed is a good thing. this bill will save a lot of lives and a lot of money and the sooner we can get to doing those two thingsthe better. If this bill is as good as the Obama/Pelosi/Reid say it is, why are they so afraid of making Representavies of their own party vote on it? We fought for our independence from Great Britain to avoid a government in which one person determined the law of the land. Nancy Pelosi is attempting to be the Queen of America in pushing through legislation without the House of Representatives voting. This only proves that our Speaker is not looking out for the will of the people, but her own career and legacy. I might support health care reform, but what our Speaker of the House is attempting is simply egotistical and selfish. This bill is not passing without a vote irrespective of what the obstructionist republicans say. It got a strong majority in the House and 60 votes in the Senate. This thing is all voted for, time to "git er done"! Jack, of course there will be a vote. This is misleading and inflammatory. The final vote in the House won't be a simple vote on the Senate health care bill. Instead, it will be a vote on a resolution which effectively passes and amends the Senate health care bill at the same time. The Senate bill is not the final health care reform measure. The House is working to structure its final vote to ensure that the Senate bill does not become law without being amended. In so doing, the House is trying to do the responsible thing, eliminating any chance of the Senate bill passing without reconciliation fixes, thereby making sure that we end up with the best possible policy. No! Not only do polls indicate people do not like this health care reform as it is structured, there is even bipartisan resistence to it in the House. Thus, Speaker Pelosi's procedural attempt at an end run. Jack, you point out that President Obama has been clamoring for lawmakers to exibit courage and to do the right thing, and that there is an absence of courage in the absence of a vote. I believe a display of real courage and of doing the right thing would be the President and lawmakers agreeing to abort this "Frankenstein of reform" (I'm pro-life) before it lives to terrorize us all. Health care reform is essential, and our elected officials have to find a better way of creating it. As an underemployed college graduate in Michigan, I don't frankly care what steps are taken to get this passed. I'm asthmatic, and the cost for my medications and doctor visits for preventative health, are astronomical. I'm lucky to make 800-1000 a month, and my acid reflux medicine would cost me 700 dollars for 3 months. Clearly I can't afford to have it – even though I went to college, and just recently won student teacher of the year for Michigan Council for Social Studies. How is this fair? Why is congress doing things that are not support by a majority? What is the hidden meaning of why they are doing this? Why has CNN been so silent on this subject? Pelosi is a chicken. Cannot accept that the American people (remember "We the People") do not want their healthcare DEBT or to be ruled by our government. Since this healthcare crap is about the only thing they have worked on since Obama was elected, I guess Pelosi will get it passed the only way she knows how. What a whimp. Once again we see Nancy Pelosi trying to force her agenda down the throats of the American public. She is the biggest problem in Congress right now. She thinks she is queen and all the her minions are scrambling for a place at the table. I am so sick of all that they are doing in Washington, I just can't stand it. I was behind President Obama when he took office, and was very hopeful when the democrats got control of congress, but they have proven they are no better, in fact are even worse, than the pompous, self rightous, and condescending republicans were when they were in office. This country is in a world of hurt just because of Washington's inability to do what the people of the country want. Absolutely. Get this thing passed and quit trying to make news. Everyone who votes for the amendments will have voted for the plan. Both plans have already passed. The republicans are nuts to stop this thing and the media plays right along with them. I am a senior in Florida on Medicare and I still want what is right for this country. Get it passed now! Politicians didn't yap all year about this for it not to happen, I'd rather see it pushed through than die on the floor. Pelosi is not only providing cover for Democrats who don't support the Senate healthcare bill. She is bypassing the whole process whereby if the House makes any changes to the Senate's bill, the bill would have to go back to the Senate for a revote. Then, with the new Republican from Massachusetts the Republicans could filibuster the bill to death. The problem is that no matter what bill gets proposed, no one will fully agree on its content. We have been debating this for over a year now with no end in sight. Lets move on with helping 30 Million people and reducing our health costs. If Pelosi needs to use special tactics to pass this, then let it be so. We surly will see what happens in a year or so after it is passed and will be reversed if it hurts the majority. I would love to see meaningful health insurance changes passed since my health care premiums have more than doubled in the last 3 years. But I think that pushing this legislation through with a non-traditional method is a lose-lose situation for this administration and Democrats in general. If it successfully gets pushed through, Republicans have a potent rallying cry for many years to come. And if it doesn't get approved, it is a huge black eye for the Democrats. Though we need health insurance reform, this whole excercise has been so badly mishandled that the only winner in the end will be the insurance companies and the "Party of No". Yes, With the Republicans bend upon failing the Health Bill during the vote irrespective of the merits of the bill for the American people, It is right of Nancy & the Democrats to do whatever is necessary to assist 30 million uninsured & thwart the Capitalist Insurers who are lobbying the Republicans to destroy the bill. Republicans have used this strategy to pass earlier bills & Democrats are right in doing so. No, and why does Obama continue to cede the "leadership" role to leaders like Pelosi and Reed on so many issues? He has exhausted the goodwill of many moderate, independent-minded folks like me who hoped he would come to the center – as he campaigned – rather than turn over everything to the old-school left-wing fringe. And, don't get cocky Republicans – you're simply the lesser of two evils at the moment. There has been such an amazing disinformation campaign against health care that I completely support Nancy Pelosi's approach to moving this bill through. 45,000 people die every year for lack of health care. One can only conclude that the Republicans want to kill 45,000 people a year. And they not only want to kill your Grandma, but they want to kill your mother, your sister, and your brother too.... or anyone else who the Big Insurance Death Panels decide to knock off when they get sick. Or should I refer to them as the Tea Party Death Panels. After all, the Tea Party is the mouth piece for Big Insurance and Big Oil. They are your "Birthers", your "Deathers", and your racist, anti-government militia folks. They are ignorant and gullible. Just look at their signs. They can't even spell. And they are being exploited in the name of corporate greed. They believe anything that the GOP and their Corporatocracy feed them. I say enough with all of the lunacy. Let's get health care passed and move on. If our elected officials would use their skills for the people they represent, ie. sit down as adults and work for the best solution for the public they represent as opposed to the lobbyist in the halls or a me vs them approach...solutions would be found that would be transparent and workable. Absolutely!!!! This is a process that has been used many times. The people who are dying due to a lack of healthcare do not care about process...they care about progress!! Pass the Bill!! They need to do whatever it takes to get some form of health care reform passed. If it doesn't pass the Republicans will suffer in November. How appropriate for a major piece of legislation that the people do not want with all the pork loaded on by politicians to support lobbyists and big pharma to be voted for by not voting. The CBO will not have the opportunity to put a price tag on it before the non vote will occur. Out with the rascals! Vote out all incumbants and insist on term limits of 12 years. If we vote no on incumbants the next three elections we will have cleansed Congress until corruption overtakes them and it will be out with the rascals again. I am an extremely responsible senor citizen with a Ph.D.and among the most successful long-term investment managers in the U.S. I have never responded to a website before but words can't say how appalled I am at the audacity of this attempt to circumvent the normal process that would be justified for such an extremely important bill. I honestly believe that this is a clever attempt to "buy" votes for upcoming elections and I believe that this is the beginning of the end of the United States. I believe that the marginal tax rates and other taxes that will be required to pay for this purchase of votes and other programs being proposed by the Administration will cause our country's GNP growth to decline in the future and that the very people whose welfare is at issue and their children and grandchildren will in the long term be adversely affected by this attempt by Representative Pelosi to bypass the appropriate voice of the American people. This is disgusting. What about that swamp Nancy was going to drain? The government hasn't demonstrated the ability to fix the Social Security health care system nor the Veterans health care system. Why rush this through? No. People should not be so short sighted. Look down the road...what will we do when this program winds up like Social Security, Medicare, and the Post Office..broke. How about we work to fix the problems with the programs we already have instead of spending money we dont have. This is outrageous. As a Democrat, I support the efforts being made on both sides of the isle to do something about health care. With so many variables, it may never yield a "one size fits all" solution that will produce the kind of changes needed. But to suggest that those we send to office to represent us need not take accountability is blatantly absurd. This has "Toyota Recall" written all over it. Transparency? Yes Ms. Pelosi, we see right through you! Absolutely not! The President's administration has been calling for an up or down vote via a simple majority vote in the Senate using reconciliation. Why not the same requirement for the House? To use a procedural trick in the House that doesn't require a vote will undermine the legitmacy of the entire process and cast even greater doubt – if such a thing is even possible at this point – on the legitmacy of Congress itself. Historically, the House of Represenatives has been called "the People's House". I fear we will have to call it "the Majority Party's House" if this happens because it certainly won't represent the People any longer. the democrats need to listen to the voters and forget about passing this bill. the people that want it passed want the government to furnish everything anyway. if they want us to have insurance why don't they let us have what they have, the politicians i mean. if we are going bankrupt anyway we might as well do it right. I predict that the first thing people will find is that the drugs, visits, hospital stays, etc will not be covered. What’s good for the goose is good for the gander. I disagree with what Nancy Pelosi is doing but please stop crying because Republicans have done this just as Democrats have done before to pass controversial laws. What the heck is she doing? She's a fruitcake! My vote to this question is NO!!!!! They should not be allowed to push healthcare reform without a vote. They should all buck up and find the "Courage" to do their jobs. Honestly, maybe if they had the same health insurance that the regular joe has, maybe they would be more inclined to vote on it more quickly and take a stand on something, anything! We all agree something needs to be done about health insurance. It's the way it's being done that's the problem. Can't they figure out what they all agree on and go from there? Can't we start by making a few changes, instead of scrapping the whole system and starting over? We don't need 2300 pages for that! Why is anything involving "student loans" in that health care bill? Our congress needs to be held accountable for the way business is being done in Washington! I'm going to be really mad at my NY representatives that we're not getting the same deals that Nebraska is getting! If the bill is so good, why are they BRIBING representative to sign it! They need to take their time and do it RIGHT! This deadline crap is for the birds. ;...and so's that health care bill! If President Obama lets Pelosi get away with this, the only way he can win a second term is if Pallin runs against him. Yes or no let them vote on everything! Sure, the speaker should feel free to use the same method that has been used in the past by both parties, especially by the GOP who has been dead set against health ccare reform. We need health care reform NOW. Once the law is in place, then we can make necessary changes. Is there no way to get rid of her. Is she elected for life? Why does the word "impeach" begin to creep into my thoughts about her? Of course, Nancy Pelosi should push health care through, by any means deemed necessary. She's a tough broad amongst wimpy old men! Absolutely not! I'm disgusted by all the back room deals and arm twisting. I didn't know votes were for sale in congress. Let people vote their conscience. What happened to the campaign promise of transpency and changing the way Washington does business. It's unconstitutional, cowardly, dirty politics. Pelosi should be relieved of the Speakership! NO!!! This is and end around our political process. The President promised transparency in his administration. This entire process is so far removed from that promise and in his version of transparency it all boils down to "as long as I get what I want". It doesn't matter that what he is delivering doesn't meet the criteria of an improved health care program for ALL Americans. The most important need in America today is jobs yet everyone is focused on this bill (or lack of it). If you aren't working you can't afford health care. It's about jobs first then a well constructed bill delivering a health care program similar to what a government worker has! Let us all receive the quality care that they all receive at the same premium level. That would get the full support of everyone. What the heck, Jack! The healthcare bill has been on the table now for weeks. Reublicans refuse to participate in its passage despite President Obama's overture to them. Moderate Democratss are too afraid of their own shadows to vote on the bill, placiing their selfish political interests over that of the people. So, I don't blame Pelosi whatsoever. If the way to get this bill passed is not to vote for it then hurrah to her. No body have the courage to vote anywaty What a bunch of pussies!. Jack, if this is the future of the nation's congress than not only should bills be passed wityhout congress' votes, we the voters don;t even need to vote at all. Goodness, what a joke America has become. I am afraid of my country. Nancy Pelosi can do whatever she wants. She just needs to remember that she will pay the price in November. No this is wrong. Our representatives should be willing to read, understand, and cast their votes on all legislation. I am deeply concerned about its cost and the debt I nation now owes. If Nancy Palosi, along with the other Dems including the President , that are all pushing so hard to get this bill passed were covered by nothing else other that this healthcare, they would definitely not be in such a rush to run this bill through ,blindly disregarding what the American people want. Their medical care should be no more than what they expect us to abide by. They enjoy all their benefits paid by the taxpayer that in many cases can barely afford to keep their family going. With this maneuver, the Democratic leaders are moving down the road that our Founders so feared, the road to tyranny. Once we slide down this slippery slope, where on earth do we stop? It is amazing that everyone has forgotten that health care bills have ALREADY PASSED both houses of Congress BY WIDE VOTE MARGINS, just in two different versions. The rule being suggested here is that the House issue its amendments to the Senate version before the two bills are reconciled. THIS IS ACTUALLY QUITE SENSIBLE. Just do it! I don't care anymore how it's done. Let the President sign a decree. Let Nancy Pelosi say it fluttered down from the heavens. Let Reid say he dug it up from the cold earth. Just somebody please do it and let's move on! NO!!!!!! she should not be allowed to.. I cannot believe that this is happening in Americal! Obamacare is a HORRIBLE BILL and the excuse that some bill is better than no bill is even worse. The American people deserve a good bill that will not destroy the economy, ruin healthcare and which is legitimately passed in the way that the Constituion intended. How bad do things have to get with side deals, cuts to Medicare, forcing people to buy insurance, medical boards that will ration care (example being the mammogram rationing), false information on costs (example being double counting the Medicare cuts), more bloat to create fed committees, etc. before this is stopped. FIX MEDICARE AND MEDICAID FIRST AND SHOW YOU CAN DO THIS and then we can go to next steps. Just look at the poor situation in VA medical care. The feds will destroy our healthcare system if this passes. Absolutely yes yes what took her so long? I am a full-time student and full-time worker. I work to support myself and my family. I have not had health insurance for years after I became to old to be covered under my fathers military insurance. I haven't been to a doctor in many years and have back problems and issues regarding my heart that are genetic. I eat well and exercise as often as possible but yet still need medical attention but simply cannot afford it. It would be nice if I could even get any sort of help with health care. So its in my hopes that this bill does pass so that I might have some help in the coming years with health care. But that won't happen because it has become a political fiasco with everyone forgetting that people depend on their government sometimes when they are in need. This is one more example in a long line of Congresional curruption exploits. What nurve...this is the biggest piece of legislation in US history and the best congress can do is to..... minipulate the process for one reason and one reason only...to save their jobs. No wonder many americans feel they can/should take what eve theyn can from the system. In this socienty only the strong and government supported... will survive. No, this should not happen on a piece of legislation that covers one-sixth of our economy. We need health care reform, but this is ridiculous. I will forever more call The Democratic Party the deemocratic party. In the future I will just deem for that party but not actually vote for any candidate. When the filibuster is gone, then this bill and all others can get the vote most favored by Republicans when they are in power – the UP OR DOWN VOTE. Until then, what Pelosi is suggesting is no different then how the Republicans shoved the back-breaking Bush tax cuts for the most affluent Americans down the throats of the vast majority of the rest of us! When exactly did 60% become a majority? This is NOT the United States of America that I have loved for the past 67 years! The self -centered, cowardly, actions of our representatives (especially Nancy Pelosi) is not in the best interest of the people and is downright disgusting, if not frightening. These spineless excuses for leaders will feel the rath of the American people at the polls. They can run and they can hide but behind the skirt of the of the Speaker of the House is truly a cowards way. If they think that they can pass this bill without actually voting on it...everyone who is coming up for reelection better seek to get out those resumes now, because they are going home for good. Congratulations congressman....all of you are at risk and we will win this fight! This is not a man or woman fight, a black or a white fight, a Dem or Rep fight it is a wrong and right fight. Nancy Pelosi is not to big to loose but the people need to know that if this passes, all of the American people will be thrust into slavery and it will cross all boundries. Stand up America and fight to the bitter end. Yes, it's the Dem's way of being proactive for something so important. Simply stated – If I am held responsible for my actions and decisions, politicians are too. If they want respect, then earn it by not hiding behind parliamentary tricks. This is why both parties have no respect in the general populace. It is enough to make you almost wish for a dictatorship. At least the decision maker is forced to make a decision and is thus held accountable. Bottom line, my government behaving like this makes me ashamed to be an American. Signed and Independent non-political American. No, no and NO! Dictator Pelosi will stoop to anything to pass this bill. This CAN'T be happening in America – but it is. Don't let this Pelosi ( a psychological/mental imbalance person)do what she personal feels right to do.She practices like Hugo Chavez,Castro and other commnunist dictators.Stop her. Yes on the question asked. We couldn't vote on the war in Iraq and that killed lives. This bill will preserve lives. Of course it's all about the money. The insurance money. Anything to pass this bill is fair. Pelosi is intolerable. If the bill had the support of congressional members' constituents, there would'nt exist the hesitation to properly pass the bill. The political massacre it will be for some members who vote a certain way might just mean it shouldn't be passed as written. Pretty simple acccounting. I would hope it didn't come down to this. But if it has to, it's better than nothing. I, personally, don't care how it's passed. Just get it done. I have great 'socialized health care' from the VA, but we need to have it available for those who fall between the cracks. My wife, and millions like her, need access to quality health care at least until they are eligible for Medicare (the other 'socialized health care'). Anyone who thinks things can remain as they are is severely uninformed. Time to get it passed........now ! If this is what it takes to get better Health Care passed. Please go for it. In a year no one will even remember. Yes they should push it through. This has been debated, rehashed for over a year.....the Party of NO deserves a good share of the blame here. They offer the same tired answers that they have for years and say NO to everything else. Where were the complaints when they passed Billions off budget for WAR....About time we start spending money on those that need the help and not on Tax Cuts for the Republicans!!!!!!!!!!! How can anyone with any integrity at all even ask the question? It's the most dishonest, repulsive act that the most immoral, disgusting, power hungry, and dishonest Speaker of the House in this country's history could conceivably undertake. Among politicians lacking integrity (which applies to 95% or so), she is the biggest liar of them all. I'd rather see it die than make a mockery of our Constitution. It is pretty clear what must happen to pass a bill constitutionally and this method is not it. Should this bill pass by this method then we will all be doomed as our rule of law will have died. If health care is not worth voting on,its not worth passing. I can hardly wait for Nov. to get here. Absolutely! The congress has messed around too long and we need to address the inequities regarding health care in our country. It may not be perfect, but it is a start! Absolutely not. Since our Grandchildren will be the ones paying for this reform bill, we should wait until they are old enough to vote before trying to pass it. Obama is in over his head and Pelosi (who is also) is desperate to cater to his every wish, regardless of the cost. The question now is "Will sanity prevail"? If it's not okay with Nancy then all the times the Republicans have done it should be revisited and voted on again. What's this double standards?? Why not? Republicans used the same strategy. They're the ones who opened that can of worms in the first place, thus, giving that power to future administrations. Of course, they didn't use this strategy on something as big as health care. Then again, they didn't bother taking on big issues like this in the first place, which is why Americans are still fending for themselves against health insurance giants. I will say, however, that Democrats should grow a new set of balls. They should stand up for their American ideals as opposed to looking after seats. Why should we allow the people we vote into Congress,or the Senate have Insurance paid for by us the people.Let this walk the same road the rest of us walk on! Absolutely not, that would be insanity. Let each representative stand up for his/her constituency and in the next election let the chips fall where they may. I am fine with it by any means get it done. The other side is not playing by the rules why should she? Get it done and lets move on to something else. As a nurse working in the healthcare industry I have seen too often those who have lost everything just to live. We are talking about hard working American's who have worked for their homes and lost them due to the need of healthcare. I watch as our elderly citizens cut their medications in half to afford to live. We are a sad country when we can not provide healthcare to the citizens of the United States. We as a country should be caring for the elderly of this country free of charge. They built the United States. Hey Jack, I agree with you. This is just so wrong.I;am a dem.and this shows me that my party has know clue what we americans want or need, they just want to ram down a bad bill and say they know what we need and want. Yes I agree the health care system is broken. We need our elected officials to fix our health care system not replace it with something that will make it worse. If your car gets a flat tire, what do you do replace the car and go further in debt, or fix the tire and keep going in the right direction. The political/philosophical questions aside – we're talking about a tremendous amount of money here. With the current price-tag (2.3t?) around the equivalent to spending one million dollars EVERY DAY for over six thousand years, am I crazy for wanting to see more caution and less politics from our government?! I am all for universal health care...but lets not rush into this?! Lets take some time, debate this thing to death and get it right before we go signing TRILLIONS of dollars away. Do you get the message, they are going to pass this bill. One that does nothing to the real costs. One which will not reach into in the supply chain for savings or changes in our standard of care(yet). Insurance has little to do with what has taken place. In global terms we have a standard of care that should be characterized as "exotic", marketing and technology driven care. Tossing 35 million new insureds into a system with limited capacity will dramatically raise costs and dramatically lower access to care, it is simple supply/demand. This policy is just as nuts as the people behind the process of passing it. Can anyone defend this bill as a healthcare solution? It is a power grab. I predict a nasty surprise that will for ever change America...........hmmmm. Whatever it takes to pass Healthcare reform should be used. If our government wasn't broken then we would have passed Healthcare Reform the "regular way" long-long ago! This whole thing has drug on long enough and is just CRAZY! When the procedure was first used it on an issue bigger that any previous issue. Was the last use bigger than any previous issue on which it had been used? Then why not be used on the biggest issue thus far this year? In terms of members of Congress having courage, I agree they should. But taking risks when there is no need is a willingness to commit suicide. No, if they can't do this via the correct way then they shouldn't do this. Do the school house rocks people need to do a new cartoon on how a bill becomes law? The Healthcare system is broken and needs to be fixed – too bad the Democrats have lost sight of the true meaning of Healthcare reform and they are only focused on being able to claim victory for having passed something with the word healthcare in it. Fact is that these bills will not do anything to stop the increase of healthcare costs. They will add to the problem and increase premiums for those who have coverage, cut benefits to seniors and further burden our children with unsustainable debt as far as the eye can see. Going to town hall meetings and yelling and screaming is intimidation. So pass it any way you can, don't let thugs rule our nation. Why is there no mention of the $1000000 per day being spent on ads pro and con for Healthcare Reform and how many people could be covered with that money, and what does it say about the health insurance industry that it has that much money on hand to lobby? How much cheaper would premiums be without multi-million $ salaries for execs and a "war chest" that rivals any presidential campaign ever run? Ok Jack let's keep it real. Both the House and the Senate have already voted and passed their own versions of health care reform so to insinuate that it would be passed without a vote is just HOGWASH! Absolutely. The house passed a bill with a public option and that should have become the law. This nonsense where 41 out of 100 old geezers can prevent the passage of a bill is more ridiculous than what Speaker Pelosi proposes to do to get something in place to fix the health care problem in this country. Jack you have aptly described this tactic as "sleazy," but I disagree that it is unbelievable at this point. That one person can bypass the entire house on any bill, let alone a $900 billion commitment, is an absolute atrocity. That the SPEAKER OF THE HOUSE would try something like this, right out in the open, is an absolute insult to each and every American citizen, whether they want healthcare reform or not. It sickens me to think that our congressional leaders are this screwed up! This bill stinks, and so does congress. I say we vote them all out and start over. Yes. Nancy needs to do whatever is required to protect citizens from insatiable and corrupt corporations. The government is supposed to be for and by the people not for Blue Cross/Blue Shield and Merck! Republicans need to get over the fact that they are not in power. They would be the first to squeal if the democrats ever tried to suggest that more than 51% of the votes be needed to pass legislation when republicans held the gavel. I am tired of selfish, greedy, totally partisan and very noisy republicans. As Jay would say "Oh shut up!". Go Nancy Go! Get Health Care Reform passed by Hook or by Crook. I don't care, just get it done!!! You can’t blame the republicans for blocking health care. It is getting blocked right now by Obama’s own party because a lot of them know how unpopular the bill is. If it was a good bill, they would have voted on it already. There would not be a need for arm twisting, or bribes, or funny tricks to get the bill passed. The Democrats need 216 votes to get it passed, and it is not there. Nancy Pelosi should not be allowed to push health care through the House without the up or demand that the president demanded. Absolutely she should. The Rule voting procedure has been used by both the Republicans and Democrats in the past, in fact Newt Gingrich and Joe Scarborough have recently criticized a proposed legislative procedure to finalize health care reform as "radical" and "incredible," despite having supported the use of the same legislative process while they were members of Congress. There is absolutely nothing sleezy about what Pelosi is doing, thousands and thousands of people are losing their lives each day because they don't have the lavish health care coverage that you and others have. I am sure if you were in these people shoes Jack, you will be calling for health care to be passed. So stop demonizing what Nancy Polosi is trying to do for the millions who do not have health care coverage. She is doing her job. Jack, to answer your question, I absolutely believe Nancy Pelosi should use this tactic to pass health care reform. Republicans have used it in the past so why shouldn't Democrats? Health care needs to be passed by any means possible! Now is the time. Unthinkable. This method of passage is only for tax breaks for billionaires and poor multimillionaires. And ONLY in wartime. Something that only cost over a trillion dollars. America needs Health Care Reform, no matter the tacitic in getting this through. The scare tactics uesd by the GOP and through the Insurance lobby is what is so appalling. The DEM opposition based on abortion reasoning is what truly is scary. Jack, we're done. Within a month of this things passing, the country will implode. We can't possibley pass this things without covering all the illegals and the Mexican drug cartels – we can't possibly leave them out. Whatever works, Jack. Look at the problem – people who die or go bankrupt for lack of health care. This doesn't happen in Canada, Great Britain or France... at ALL!!. If this can't be afforded, what is the money being spent on instead? What could be more important? Why is everyone so worried about insurance companies? I guarantee you, Jack, they can look after themselves. This is too important to the nation to be left in the hands of private enterprise. Yes. I say "Do it, Nancy, go for it" I'm so disgusted with Republicans at this point for not really participatingn health care reform that I'd rather see the bill pass any which way rather than see it die. I'm angry. we took up arms. By what logic is it assumed that an imperfect bill will be better than the current situation. When threats and payoffs dictates the passage of policy, e.g. the stamp act, that policy like the rule of King George III , is obviously rotten to the core. I am a health care worker and a registered democrat. I see alot of things that can be done to improve the industry, but few of those are in this bill. When one puts party loyality above the will of the people and claims to be doing so for the good of the country its Deja Moo time. When few people claim to know all that is good, democratic is dead. All hail king Pelosi. No the answer is no. This is even worse than reconciliation. It bypasses our whole system of governing in this country. It has no consideration for how we the people feel or think on this issue. When government decides they are going to impose their will over the will of the people then it's time for everyone to go. If we allow this to happen, then we have opened the door to Tyranny: the word "tyrant" carries connotations of a harsh and cruel ruler who places his or her own interests or the interests of a small oligarchy over the best interests of the general population, which the tyrant governs or controls. Just look at the actions of your so called Representatives people. Until we get term limits for all elected officials, we are going to be stuck with these arrogant, so-called public servants. Very obviously the democrats have to use these tactics to counter the way all of republicans stand against anything this administration tries.By the way, this republican stance has nothing to do with what americans want, They are all(republicans) corporate puppets . It is utterly disgusting and shameful. While every single proposal may not work, to reform healthcare is in the best interest of the country as a whole. Pass it by any means necessary! Do some journalistic investigation and you would find out Newt Gingrich started this about 15 years ago. As said by someone else, Repubs open the door and start some rule and then whine when Dems walk through. Congresswoman's Pelosi's trheatened use of "reconcillation and deem" procedures are, at best, an abuse of power and position. Actions such as these coupled with bribes (The Louisania Purchase/The Cornhusker Kickback), lack of biparticanship and transparency, excessive personal perks, deceit, and intellectual arrogance are why Americans do not trust our elected officials. Get used to this. It's the same way they passed laws in the USSR. Again, this is not about health care. They don't care about our health. If they did we would be on the same plan that our congressmen are on. This is about government control. Sounds like something Bush and Cheney would have absolutely exercised on this opportunity if they had to...so I find it ironic that the Republicans are "rightfully" upset about this. As one of the uninsured and sickly, I could care less how they get it passed, just as long as its passed. I have been a registered voter since 1984 when I first voted at age 18. Over that 26 year period or so, I have never seen such childishness from elected officials over getting help for people who need help. I could care less which party helps me, just as long as I get help. Stop the party line bickering, come together and get to work. If not both parties could look different after November. What happened to a government by the people.....this is absolutely wrong any way you look at it. I would have to add cowardly as well. Who cares how it's done, just get it done. This country should have universal health care, thats why the Dems were elected !!!!!!!!!!! If the House fails to cast a true up or down vote on Health Care, that will be the ultimate mockery of Obama's pledge for more transparency in government. Unless of course, you view the lack of a true vote to be patently transparent in revealing that the party in power lacks the courage of their own convictions. Come November, the electorate will not forget. The Republicans have used this tactic many times, and ran up our deficit to unprecedented heights doing it, and NOW you get outraged? If an insurance company, a bank, a airline or anyone other that congress was doing things like this, there would be a congressional investigation. They do things they would scream about if others did it. The cost of this health care bill goes beyond health care. It is the new agencies, increased cost to states for medicaid, higher insurance premiums. We want pre-existing condition covered. However, that alone will make your insurance premiums go up. To cover an additional 30 million people with make your insurance and taxes (federal and state) both go up. No one knows the cost of all of this. I think each member should have to vote on the bill and say were he stands. If you can't take the heat get out of the kitchen. I can see it now they will pass something they once again can't pay for and no one understands, then erect a tax to fix it later. Listed right below social security on the paycheck "Obamacare" yet this time their will be now cap on how much income they can tax. We've seen this many times, Jack. Both parties have done it hundreds of times. You're hearing about it now because Republicans are loud whiners. Democrats don't cry as much as Republicans do when theya ren't in charge. The Party of No needs to GO! We have got to vote these people out and put in term limits before they completely destroy this great country. How can the population be so stupid.Look what happens to countries that make the population poor and dependent on the government for everything. Do you really think Pelosi wants you to have her lifestyle. This is despicable. The only reason the Democrats are trying to force the bill through without a regular vote is because they DON'T HAVE THE VOTES. The reason they don't have the votes is not because most people don't want health reform but -just like the stimulus bill-there is too much other special interest crap thrown in. It is way out of line with what the American people want. Congress and the President just don't get it. I'm a vehement Democrat but no, she should NOT be allowed to do so. This is the kind of stuff Dictators do. since when did she become dictator, judge, jury and president ? Could the democrats be any more hypocritical and corrupt then this. Furthermore; this truly shows how in the tank the so-called "mainstream media is for the liberal/big government agenda". Can anyone with a shred of honesty deny the firestorm the republican party would recieve from the media if this situation was reversed. Everything Pelosi, Reid, and Obama states is either hypocritical, deceiving, or an outright lie. This is the hope and change we voted for and how about "the most transparent government ever"? Lies straight forward and undeniable. Should the name of the Democrat Party be changed to the Communist Party or the Dictator Party. Sense when don't we vote in America. The Obama Administration and Congress have turned into corrupt mobsters! Are they inviting a coup? a civil war? I see people getting pretty mad at Washington if the politicians want to act like this is China! Will Obama order tanks to the National Mall? Will Congress post a battalion around the Senate Building? or Will the tank blast the White House? and the battalion storm the Senate? Is it time to rename Washington; call it Beijing. The election is over, the people have voted. Pass the bill and quite trying to redo the election. I hope they do go against the will of the american people because that will be the end of them. The down side will be turning america into a bigger welfare state then it already is. Of course thats what the democrats want in the end. Get it done! All the politician's should be taking more action to help the American people NOT their own political endeavors and "bankers". Stop the distractions: The minimizing of healthcare's importance on the large majority of needy Americans NOT the minority who already have "protected" healthcare because of income. If this process is legal, and will work, go for it. Nothing else and very few legislatures are seriously working this issue. If the president could do it by himself, It would already be in ACTION! Stop the insanity and hyper-maddness!! Get it done and move onto the next serious issue facing Americans....JOBS!! Pelosi has no right under our Constitution to pull this on the American people. We need reform – but not at the expense of our Constitution. We Since when do you have a bill involving 1/6 of our economy shoved down our throats without even a legitimate vote. This is about victory for her. I have never seen anything like this. I am a senior citizen and I feel like we are losing our great Republic. The people deserve a vote. If Pelosi thought this bill was so great – why is she trying to use this tactic. I hope the people in her district of California will not return her to office. Open up the free markets. Let people buy insurance from any legitimate insurer in any state!! They give 11 Billion to Acorn and Acorn will be their enforcers. Trillions to AIG (Sharia) and 21% cuts to Medicaid and the handicapped. I believe we are seeing the end of our Great Republic. Representative government appears to be on its way out. It seems that there is a lot of support for Big Government. And the answer of course is to "Tax the Rich" to pay for all the government handouts. Be careful what you wish for...When we have taken all the wealthy have to give and they are now poor from paying for all of the government waste and mismangement...where will the money come from to continue our appetite for the Nanny State? Do you people not pay attention, the Bush tax cuts were across the board, inclusive of all taxpayers, not just the rich. BTW, the vote on the 2001 tax cuts was 58 – 41, appears there was bipartisan support for the cuts. Jack, I say yes. It's shameful that the GOP is dragging their feet as a party of no. I'm from Texas, and we have a mandatory car insurance. Why can't we have a mandatory health insurance? Infact, my car has a better insurance than I do. We have spent billions of dollars fighting two wars and rebuilding the enemies infrastructure and we can afford a decent health care for our citizens? Not passing health care reform will amount to a gross injustice against humanity, period. James Madison would be rolling in his grave if he heard about this. On his birthday week too, how outrageous. Whether you are for health care reform or not, this politics at its worse and demonstrates why so many Americans think the federal government is broken. By the way, it is broken. Whatever it takes. Healthcare reform and banking reform are the two most iportant issues facing our country. The last time we realistically took a good hard swing at healthcare was back in the Clinton administration. It was killed then by the No party after a similarly brutal mudwrestling match in Washington. After that political exhaustion with the issue set in and nobody in the Democratic party had the nerve or energy to champion it since then. If it fails now and we "go back to look at it later" that later will be another 15 years. We can't wait any longer. This has GOT to happen by any means. The do-nothing party of Republicans has screwed this country too badly and for too long to let this one glimmer of opportunity fade. Ram it through! Easy does it, Jack. The tactics of the rightwing/insurance coalition have been very scary. In these United Corporations of America, it takes a lot of guts to vote against your major funders. If Speaker Pelosi can come up with a way to accomplish much needed healthcare reform that bypasses these nitwits, more power to her. The Republicants have used every cheap and sleazy tactic to sabotage Obama's agenda. Obama has been too nice and too accommodating with them and gotten nothing for it. Now, it's time to shove this bill down their throats. Yes pass it and see what happens. Nothing is nothing, the country needs change not necessarely this kind but something must give.This maybe a start. This is beyond the pale, how cowardly of the democratic leaders to try to hide behind a 'no vote' legislative maneuver! This trickery is not what our founders or any decent legislator would deem as representative government. I say, vote on the measure or be voted out of office! No. I can see voting for what you believe is best but to do it in secret undermines our whole representative system. It seems to me even the communist party vote on new laws. Have we become a monarchy? We fight an unjust war in Iraq, with the excuse of establishing a "Democracy" in a place of a despotic tyrant, and then have our Congress reduce itself to that of a despotic tyrant. I favor the bill, and it deserves a vote of our representatives, and then let the consequences lie. Representatives of both parties have been paid off by the same lobbiest, they no longer represent the people, but the industry. This is the first large crack in the foundation that is America. If this corruption and shameless disregard for the Constitution and the will of the American people is allowed to stand, then we have taken our first steps down the road to ruin, led by the most incompetent and unprincipled among us. As far as I am concerned, do whatever it takes to pass health care/insurance reform. Just get it done. What do we teach our schoolchildren now that Congress no longer wants to follow the constitution by creating its own version of how a bill becomes a law? The new visitors center in the Congress explains exactly how a bill becomes a law. How can our elected leaders pass a law without a vote? Maybe because we have no leaders in congress that have the courage to follow the constitutional process. Oh what a poor example our congress will be setting by ignoring the pleas of their constituents to start over rather then ramrod this convoluted bill that nobody understands what is in it or what it is going to cost. Sadly, some want to do this without accountability. We are supposed to be a nation with a representative form of legislature designed to provide the checks and balances that our constitution constructed to protect "us" from the evolution to dictatorship or monarchy. Whether Republican or Democrat, the "deemed" approach is a sign of a failed government. Let them jam it down our throats. The next election will clean out this water closet form of government and we the people will take charge. Both parties have missed the true root of the evil. It couldn't be anymore evident that it's time for term limits, tort reform, and the need for universal healthcare for the tax-paying citizens of this nation. It's time to start over. NO. I gaurantee that at least half the people that are saying yes to this haven't paid a dime in taxes nor will they ever have to pay for this. This is a cowardly act. They were elected to make decisions not ptotect their seat! Jack, you are either asking this question “tongue in cheek”, or you are losing it—I'm not sure which—all of the tea bag loonies, who are hysterically calling Washington to undermine healthcare reform—see what they are doing as “undermining Obama” –the two are inseparably fused in their puny brains – and with the Republicans working for the interests of the wealthy few, rather than the American people – why on earth would you get self-righteous about anything Nancy Pelosi is doing? If our representatives accept this Peloci tactic of passing a law without actually voting on it, then our congress has reached a level of arrogance never seen before in the U.S. Obama and Pelosi believe they know what's best for the American people, so they will do whatever it takes to pass their version of healthcare reform. To hell with American tradition, the rule of law and common decency at a time we need them most. It's time for the Supreme Court to step in before we have a real Constitutional Crisis. This situation is starting to really stink! I smell the handywork of Rahm Emanuel!